Think about all the time you spend in your bathroom, it is normal that at some point you get tired of it and decide it’s time for a change of scenery. But is major work really necessary to renovate your bathroom? In general, construction work at home is often expensive, requires a lot of time, dedication and, above all, patience. If you are not willing to go through all the hassle of construction work in your home, here are some tips that may be useful to rejuvenate your bathroom without spending a lot of energy or money. Nothing will change the look and feel of the bathroom more than the flooring. And the good news is that you can easily install water resistant flooring which looks amazing and is totally practical for a room which has a lot of moisture. Many options can even be installed on top of existing flooring, so no major work required. And what’s more, it’s long-lasting, and easy to clean and look after. The lighting in our bathroom is a fundamental element that must be prioritised. On many occasions we tend to focus on other elements, such as furniture, which is not so decisive for the aesthetics of our bathroom. If your bathroom is not well lit, it may seem dull and uninspiring. With convenient lighting we will not only feel more comfortable in our bathroom, but we will be able to create distinct spaces. As an example, task lighting that does not produce reflections or shadows near the mirror, and lighting around the bath that lets us relax. Having good storage in the bathroom with shelves or cabinets will help us give a different air and feel to it, and at the same time organise everything well in the bathroom. The linens in the bathroom are at all times in sight, and are decorative elements, as well as being functional. Use towels and carpets to create mood. You can choose them in exactly the same colour range for a monochromatic look, neutral colours for a more complex bathroom or with ethnic prints to give it life and colour. If you do not have a screen and you have a curtain in your shower or bath, have you thought about renewing it? The shower curtain occupies a large part of the space and is very useful. An insipid curtain with stains or mould will not help us to like our bathroom more. There are many inexpensive alternative options that can make a huge change to the way our bathroom looks. Painting is one of the most affordable ways to give a completely new look to your bathroom, especially if you do it yourself. 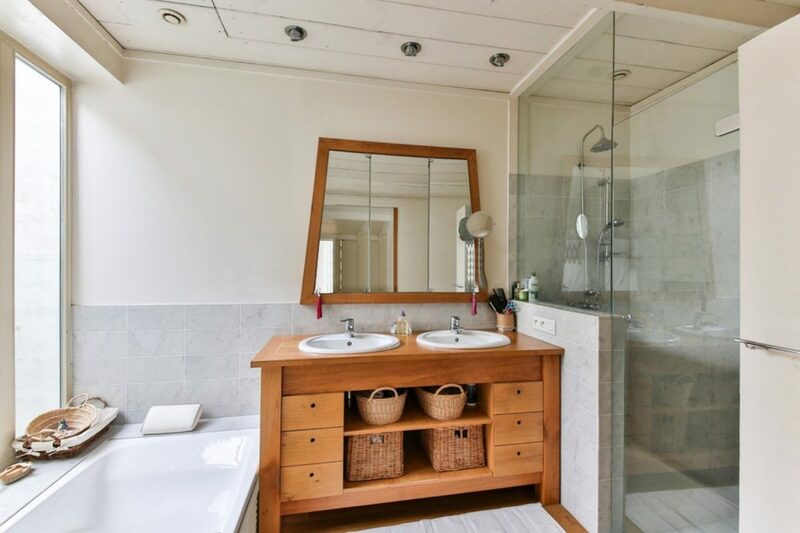 Before painting the bathroom, make sure that there is no moisture, or if there is, eliminate it with a special product such as an anti-mould / fungicide cleaner one day before painting. For a professional finish fill the fissures and holes with a water-resistant putty. When the surface is dry, sand it so that it is flat, in this way you will have a perfect surface on which to paint. As far as colour is concerned, soft and neutral tones are usually advised as they give the perception of greater space room to a room that is usually small. But, when it comes to personal tastes, there are no rules, so let your imagination fly! With these simple tips you will be able to renovate your bathroom quickly, comfortably and economically, without the need for major construction work in your home.